“Imagination is more important than knowledge. For knowledge is limited to all we now know and understand, while imagination embraces the entire world, and all there ever will be to know and understand.”― Albert Einstein. The participants of the Gallery of Imaginative Play and Games - children and adults - think out new games and fairy tales, they play with different objects and make the small works of art from the simple objects. In the Gallery there are 146 projects from various regions of Russia and the world (see the map). The number of subscribers is also growing. 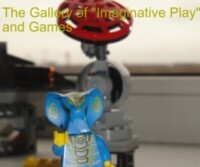 I hope for the further development of the project and I want to invite you to read the Third review of the Gallery of Imaginative Play and Games (projects from 81 to 146; you will be able to find the first and second review of the Gallery here and here). 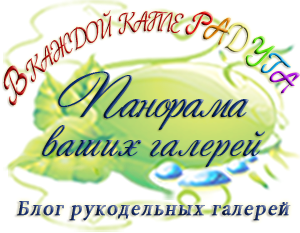 Olga Astrakhantseva, Ust-Kamenogorsk, Kazakhstan ("Magiya biologii") tells us about the miracles of biology and makes this science interesting both to the children and to the adults. a great interest was also attracted by her to the experiments with a tulip (134) and, of course, to the top ten summer ideas for children (137). 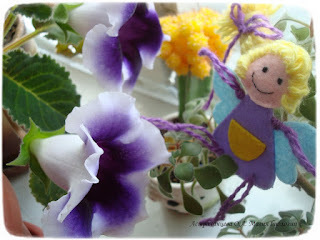 The charming fairies, who are thought up and made by Olga, act as Olga's assistants. These dolls help to tell the stories about different phenomenons in the world and to pose tasks to children. Besides, on Olga's blog "the meetings" of the puppet theatre permanently take place. Owing to these performances with the toys of animals Olga answers questions of the children (parents, teachers, etc. send the children's questions regarding biology to Olga). Questions are sometimes very unexpected: "Why monkeys don't fall from trees?" (92, 99); "Why air is transparent?" (107); "Why the wood is called a natural sponge?" (116); "Why some fishes have whiskers?" (132); "How to learn that fruits have ripened?" (146). And do you ask such questions? The 'thirst' of knowledge is natural to children, and it is great that there are people who are ready to help children and parents to find responses to the various questions. Olga's blog post about her understanding of play (102) is also interesting in this regard. it is always curious to read the review of the marathon (131). I paid attention that in the comments to the articles of Olga the parents and the teachers wrote that a lot of children have diaries of researchers and even some tools for the experiments. It proves the fact that owing to play it is possible to support children in their aspirations to receive new knowledge. 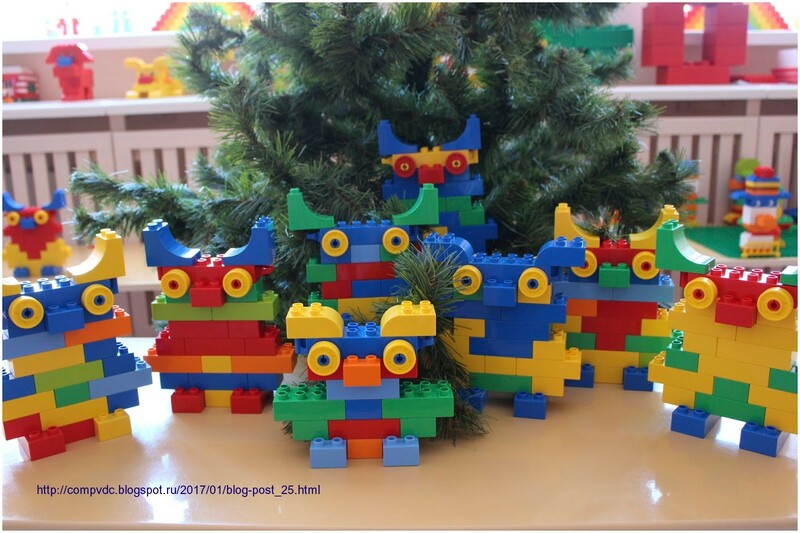 (Dnevnik LEGO-STUDII) is the new participant of the Gallery of Imaginative Play and Games. She shared the results of her lessons during which the children's toy constructor became the owls (82), the flower glade (83), the frogs who were going to the carnival (103), the Lego- cats (106). 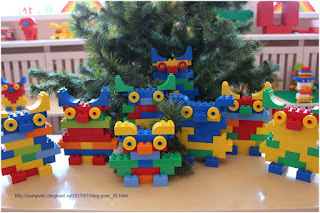 Photo from the blog "Dnevnik Lego-studii"
Thus, the toy cubes became the most unexpected heroes, and the children understood that it is possible to construct all you want from simple toys: only a little imagination is necessary. Big job is made by Anastasiya, who is creating new diagrams for hand-made art crafts from cubes. In Anastasiya's blog there are also several blog posts devoted to the animation studio. Children make cartoon films and permanently win different competitions. We will be glad to see you with your animated films in our Gallery! Natalia Guryeva, Chelyabinsk, Russia ("Babochki") continues to invent different interesting games and hand-made crafts. In the project number 84 you will see a lot of ideas about different materials which can be used to make toy birds: it is not only drawing or plasticine, but also the calculating sticks and toy constructor. The opportunity to try different techniques causes children's delight, helps children to remember the new material better. The toy cloudlet made for the respiratory gymnastics (91) can become one of the most favourite objects for children and help them with the correct development of the speech. 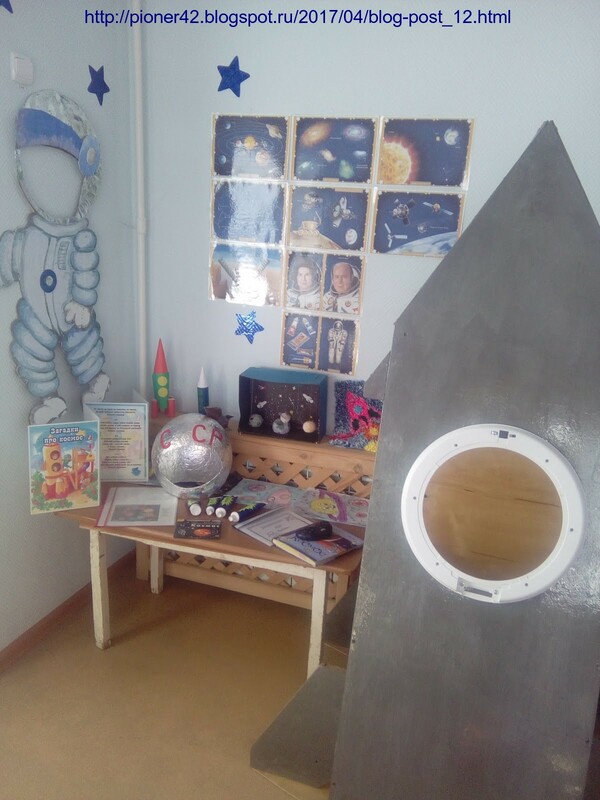 In the day of Astronautics (110) children could visit the space on the toy rockets, made a collective collage and personal hand-made crafts. It is obviously that the theme of space is interesting to children. Teachers and parents thought out fascinating play and games at the day of Astronautics. Spring walks (117) of the kindergarten group "Babochki" were also exciting. The natural curiosity of preschool children can be satisfied in the simple walk, because a cloud, a leaf, and a grass are the reasons for the imagination and adventures. The main thing that the aspiration of children to receive new knowledge must be supported by adults. It would be desirable to emphasise the games connected to the emotional sphere (138). Different cards with pictures of emotions and feelings helped children to understand this area better. Once I was at the cinema and I noticed how small children were worried when the girl from an animated cartoon didn't know how to cope with her feelings. The area of emotions and feelings is important for all children, therefore, the games directed to the emotional sphere are necessary not only for the preschool period but also for the further normal development of the child. the idea about a combination of artificial and natural materials can help develop children's imagination (creation of birches with the real natural materials (139). Once again it would be desirable to emphasise the value of exhibitions which Zhanna Vitalyevna organises after each lesson with children. I think that it supports and inspires children to make new hand-made arts and crafts. This also prevents complexes of children. 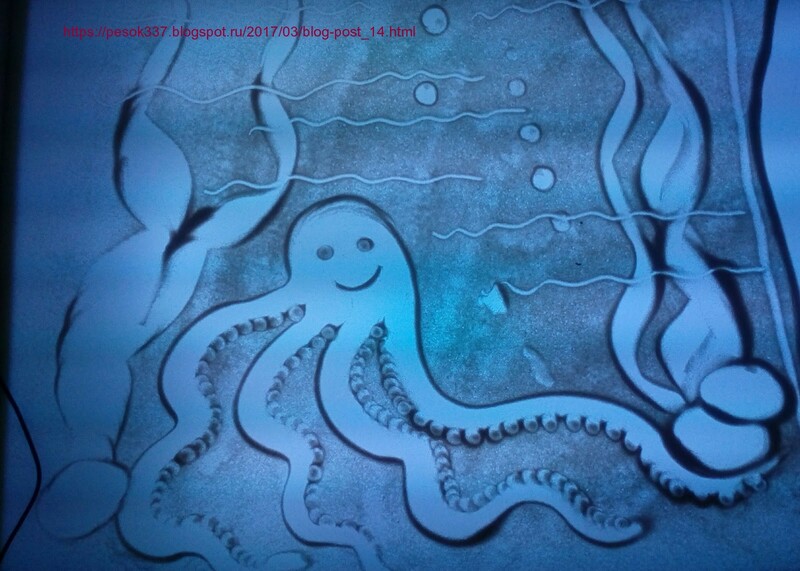 Elena Ishimova, Chelyabinsk, Russia ("Pesochnie phantazii" and "Smeshariki") successfully acquaints us with the creativity of the children. 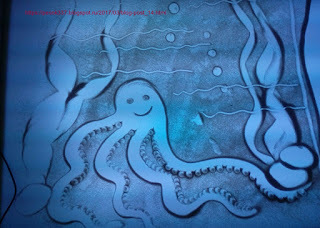 In the sand studio the preschool children created underwater animals (86, 87, 95, 101): characters (octopuses, crabs and others) were very different and could become the heroes of the animated films made by the children. The lessons devoted to the ancient world - to dinosaurs and mammoths (122, 123) also took place. In such play children remember new information better and gain necessary knowledge. 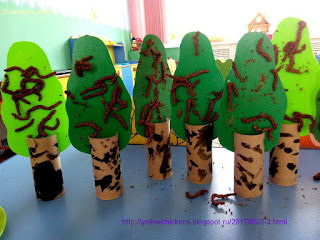 Photo from the blog "Pesochnii phantazii"
In the group of kindergarten Elena has also given several lessons which she has shared with us: children met birds (100), creating them from the most unexpected materials, for example, such as the dried-up leaves; children met the magician - water (120); they performed tasks of the Spring Marathon, creating fascinating clouds, birches, etc. - 129). And Elena Ishimova's son - Andrey has made the real masterpiece - his mother on a spring walk - by the means of the plasticine(130). Olga Shumkina, Krasnodar, Russia ("Doshkolnay vcelennaya") joined Gallery quite recently. 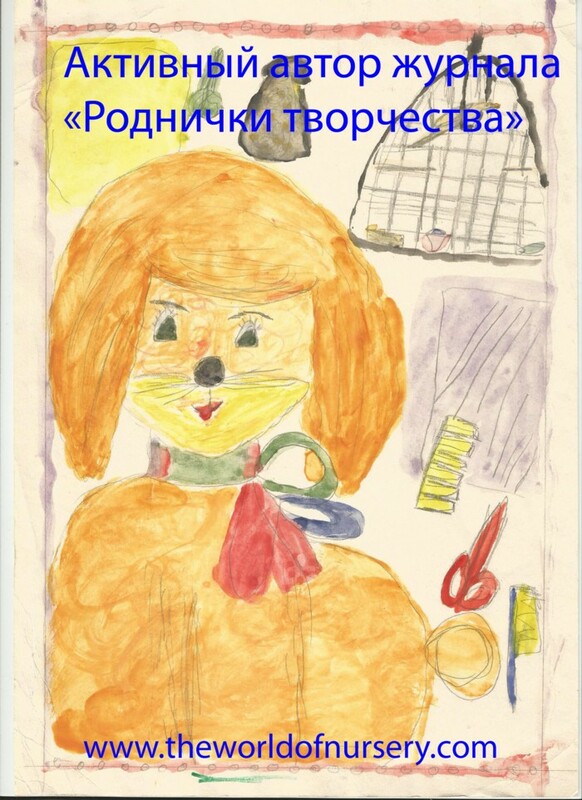 She decided to share with us two projects connected to psycho-gymnastics in the kindergarten: "Kittens are going to travelling" (90) and "At the puppet theatre" (104). 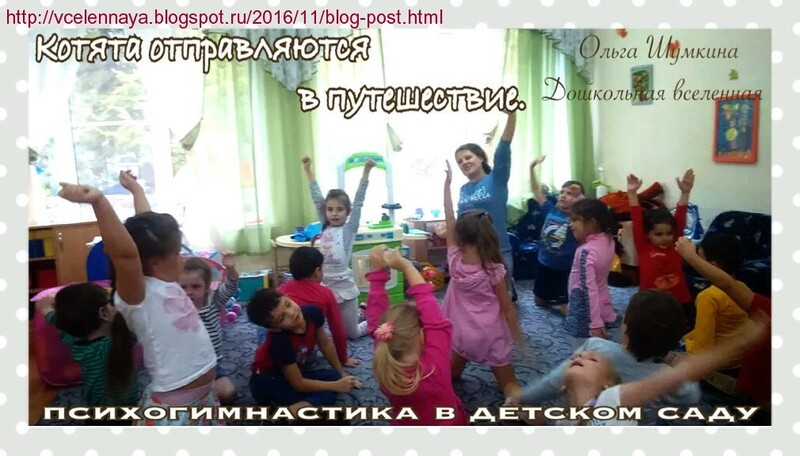 Photo from the blog "Doshkolnaya vcelennay"
Such lessons bring enormous benefit to children, including a physical activity, an opportunity to cope with bad emotions. I would like everybody to pay attention to these projects because such experience is necessary today since children lack "good risk". Olga Fedoraeva, Omsk, Russia (the blog of the educational psychologist Olga Fedoraeva) took part in Gallery of Imaginative Play and Games with a blog post about the creation of a sandbox for the sand play therapy (97). The number of objects for the sand play therapy collected by Olga makes an impression. Earlier I saw similar sandboxes preferentially at the crisis centres for children. However now sand play therapy can be met in many normal kindergartens since it helps to 'play' with the situations connected to difficulties and problems in the child's life, to remove stress and to relax. Sand play therapy is necessary for preschool children, and sometimes for adults, who are working and communicating with children. in the 133rd project it is possible to read about games devoted to the development of the emotional sphere. 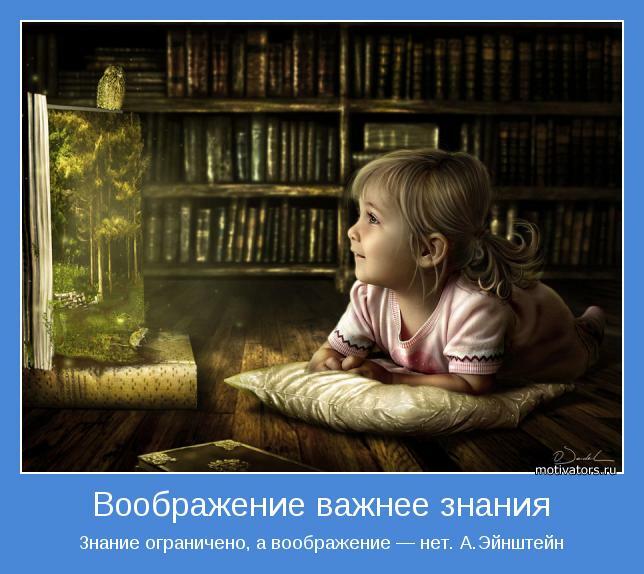 The games invented by Anna together with the children develop imagination, support creativity, help children to study, to understand their inner world. The creative approach is the guarantee of the successful learning. We congratulate Anna and her children with the victory in the competition of the Blogs of Mothers project and we wish further success! Photo from the blog "Vecelii budni"
114 - the coat of arms of Chelyabinsk. Many readers learn something new from Natalia's blog: for example, that the manual from the simple tubules is necessary for respiratory gymnastics and development of the speech of children; that it is possible to draw by the means of glass balls and that it is possible to make real heroes from the plasticine. Natalia also won first place in the one of the competitions of blogs of teachers. We congratulate her! We wait for the new master classes and lessons! Photo from the blog "Detki-komfetki"
Anna Shigaeva, Kemerovo, Russia ("Skazochnay strana") shared with us the game "We Are Astronauts" (108). Anna as the keen teacher tries to organise the developing play environment, invents games in the group of kindergarten. The detailed description of a game is important both to adults and children, and the exposed video fragment only confirms how children are fascinated by the Space. 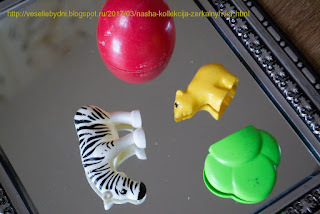 Photo from the blog "Skazochnaya strana"
Nadezda, Podolsk, Russia ("Vidumshiza") together with the daughter Ksyusha shows interesting games. The games invented by her mother help Ksyusha to perform tasks, to draw, to dance, to learn songs and to learn the world around. The theme of mice became the fascinating mouse week (113); Nadezhda and Ksyusha made a spring box (118, 141), passed spring quest (127), played the fairy tale (142) and performed many tasks (143). Nadezda often selects activities which are more difficult, than it is expected to the age of Ksyusha. 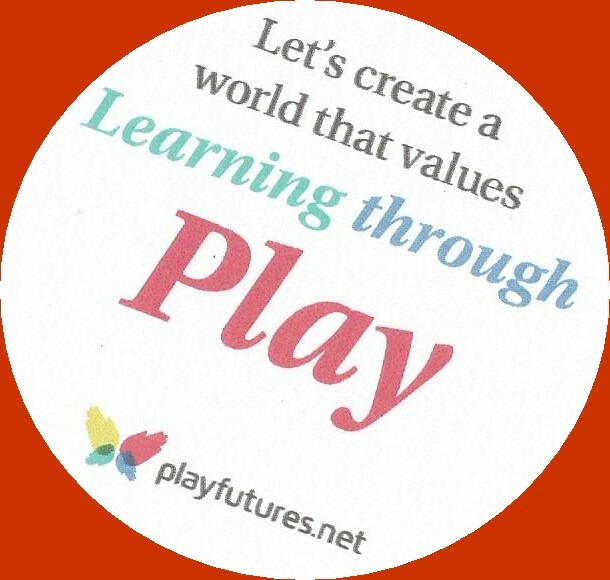 The zone of proximal development is visible in children's play (L. Vygotsky). In the play, the child tries to solve tasks which are more difficult, than she/he meets in everyday life, and when the adult is involved in this process, the effect will be faster. You shouldn't worry that the child can't execute something directly. Regular systematic play, lessons of the adult with the child will always lead to the mandatory positive result. You are on the right way! 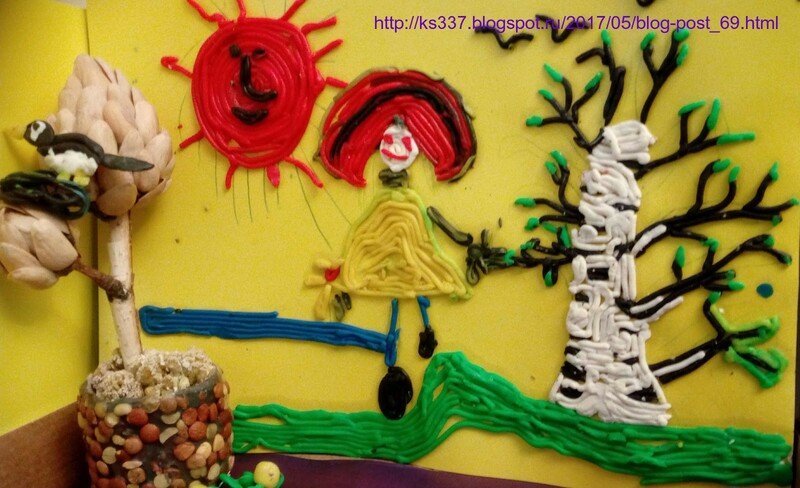 Alesya, Mogilev, Belarus ("Poleznie karmashki") decided to join the Gallery of Imaginative Play and Games. She shared with us the fairy tale about flowers (135). Alesya and her son Leva used the preparations for the fairy tale which were offered by Anna Ignatenya, and I think that Alesya and her son Leva will continue to dramatise different fairy tales since they liked such experience. 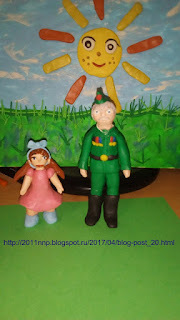 Photo from the blog "Poleznit karmashki"
Elena Andreeva, Chekhov, Russia ("Gorodskya pheya") also decided to join Gallery of Imaginative Play and Games with the fairy tale about a coward starling (136). The attention of readers is attracted to scenery and the main heroes. Everything is very interesting, colourfully and helps little Yura to play, to develop imagination, to represent different situations. Photo from the blog "Gorodskaya pheya"